Salutations polish addicts! For ages I have seen Shimmer Polish around and about the blogosphere and I always thought to myself, “Self! Those sure are some purty glittery polishes!” Why yes my southern country bumpkin accent is always more pronounced when I’m talking to myself but never you mind that. So I put Shimmer on my “To Get” list and as I started collecting indies they kind of got buried on my list even though I’ve always been drawn to the glitz and glitter of the polishes that she makes. Then I won a giveaway! Gosh I love when that happens! Anyway I won a bottle of Shimmer Polish! Finally I own one of these little bottles of glittery joy! Please allow me to introduce you to Jennifer. Jennifer is just a lovely sparkly glitter bomb! While there is a lot of sparkle and pizazz going on I didn’t feel like this polish would be too edgy or over the top for a professional setting either. 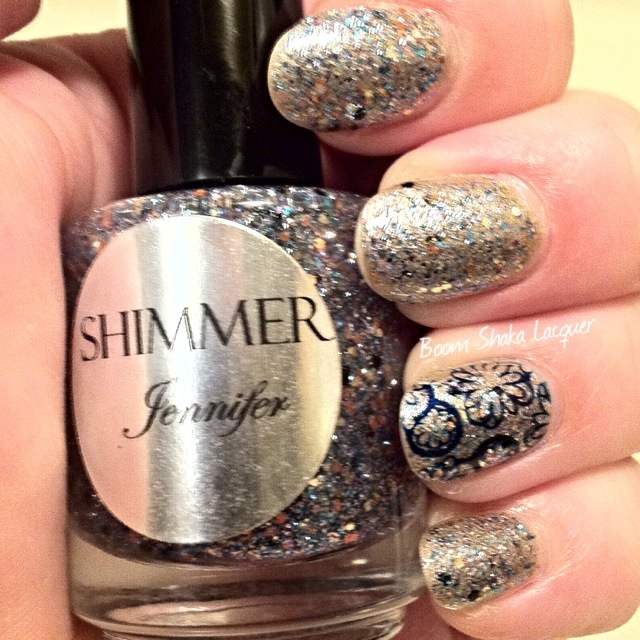 Jennifer is a clear based glitter topper (though you probably could reach opacity with a few coats since it is packed with glitter.) The glitter is a mix of sky blue and silver microglitter, with small metallic copper/dusty pink dots, small matte dark blue or black hexes, and perhaps some others that I couldn’t detect! I’m talking tons of glitter and sparkle. I layered this over a champagne frost polish and the whole thing just gives off a luxurious feeling. Application was easy breezy and I had no problems at all getting a decent spread. These pictures show one coat over undies with just a nice coat of HK Girl Top coat! I did stamp a little on the accent nail as I actually wore this for an entire week and I can’t leave well enough alone!! I can’t wait to get my hands on some more Shimmer Polish as I was super impressed with everything about this polish! Plus, I’m a total glitter fanatic so these are right up my alley! You can keep up to date with Shimmer Polish on her website and facebook page. You can purchase Shimmer Polish in her Etsy Shop. 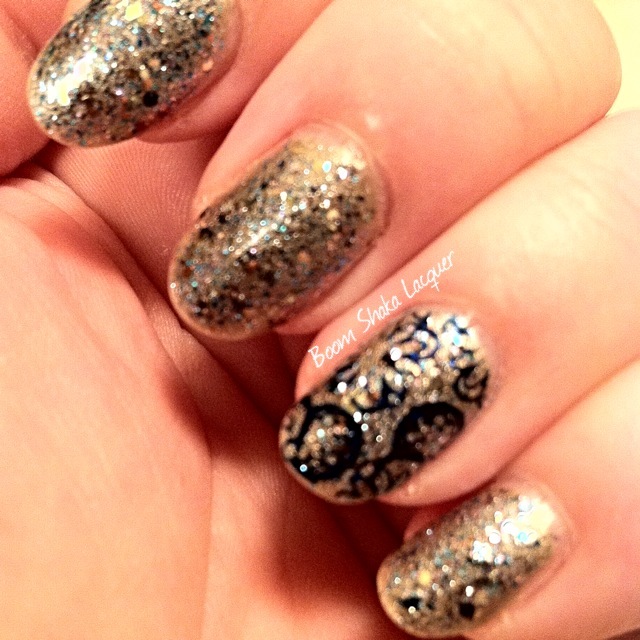 This entry was posted on January 1, 2014, in Indie Polish, Shimmer Polish. Bookmark the permalink. ← Newsflash – Major Lemming Slain in This Year’s Black Friday Sales!